Seam defects. 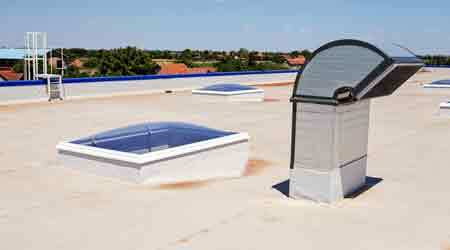 The modified bitumen roofing material is installed in long sections that are 30-35 inches wide. One section is adhered to the next by a lap of several inches. Thermal expansion and contraction, improper application techniques, and stresses can create seam failures or the formation of voids in lapped areas. Workers can correct minor seam failures with adhesives or by reheating the seam. Punctures. The modified bitumen membrane is susceptible to physical damage from a number of sources, including punctures from tree branches, foot traffic, dropped tools, and mechanical system components. Vibrations from mechanical equipment can even cause mechanical fasteners to back out, puncturing the membrane. Workers can easily patch most punctures. Blisters. Blisters indication moisture has penetrated the membrane. Correction requires identifying and eliminating the source of the moisture and replacing the impacted membrane areas.